JFCS Holocaust Center welcomes volunteers! Some of the volunteer opportunities available include assisting members of the Speakers Bureau, providing support for our large education programs, such as the Day of Learning, and working in the Tauber Holocaust Library and Archives. For more information about volunteer opportunities, please contact Alexis Herr at AlexisH@jfcs.org. 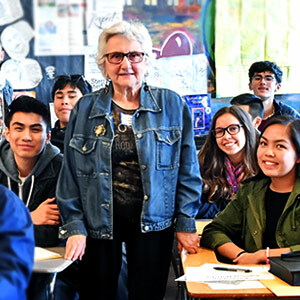 3gSF is a forum based in the Bay Area for grandchildren of Holocaust survivors (3Gs) to meet, connect and explore our shared history. The mission of 3gSF is to serve as a living link between the history of the Holocaust and today.